Answer: Well, I can’t say for sure, since there are many things that look like what you described. But my best guess, especially given the time of day, is that you probably saw a high altitude weather balloon. These balloons float so high up in the air, some as high as 20 miles, that they can still catch the light of the Sun even after it has set. The diagram above shows how this can happen. When the Sun sets at your location, it’s obviously still “up” in other places on Earth. Shortly after sunset (or before sunrise) the angles can be just right for the Sun’s rays to illuminate objects in your night sky, including airplanes, birds, satellites, and balloons. 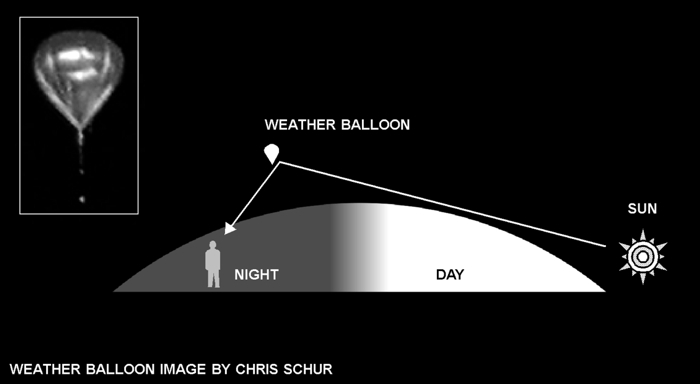 Weather balloons don’t have any flashing lights, but they are up to 20 feet in diameter and highly reflective. And they move relative to the stars, as you say you observed. Not surprisingly, these things often trigger UFO reports to police, airports, and military bases. Next time you see one, grab your binocs and take a closer look. The inverted teardrop shape should be easy to make out. My thanks to Chris Schur for permission to use his weather balloon photo. Previous Previous post: Good Dog, Want a Treat?